Check to see if your electric scooter, bike, or go-kart make and model is listed in the Browse Parts by Make and Model section to determine which battery charger it requires. If you can not find the electric scooter, bike, or go-kart make and model then we have two solutions below to help determine the right battery charger. If you have the old charger and it is not missing then a new one can be found by reading the output ratings of the existing battery charger. The output ratings should indicate the Voltage and Amp rating of the charger. Simply match these ratings to the same ratings of a new battery charger to select the right charger. Next the proper output plug will need to be selected. To select the right output plug view the available output plug options below the battery charger description and click on the add to cart button to the right side of the correct output plug. 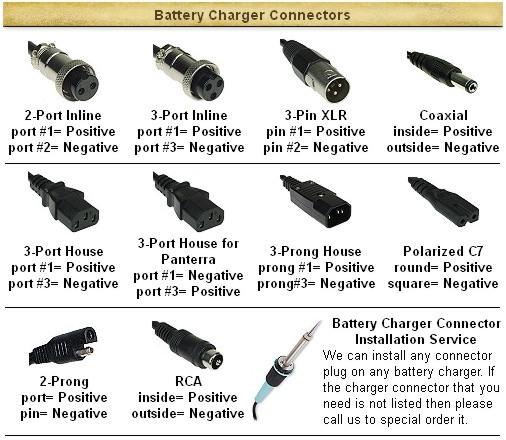 Battery chargers located with the method above can be found on our Battery Chargers page. If you can not find the right output plug below the battery chargers description then we can usually custom install the right plug on the charger. In this case please submit a Support Ticket and request to special order the battery charger that you need with with the output plug that you need. We will reply to the support ticket with a link that can clicked on to order the battery charger with the output plug that you need. If your scooters make and model is not listed or unknown, and if the existing charger is missing or does not have a sticker on it with the output rating, then you can determine which battery charger is required by counting the number of individual batteries in the battery pack and reading the Amp hour or Ah rating on the batteries. For example, if an electric scooter, bike. or go-kart has three 12 Amp hour/Ah batteries then it would require a 36 Volt 1.6 Amp battery charger.